Being wired to the world, instead of wound around the word. The lines in art. 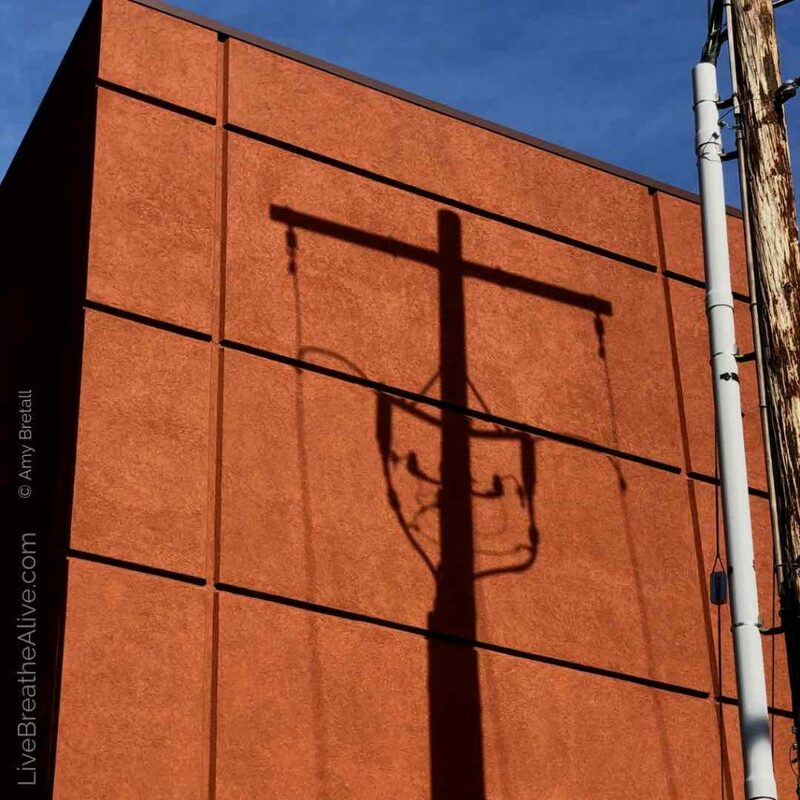 Vertical and horizontal from the electric pole shadow casts a showing of faith. It speaks to me – “YOU are Rising Up,” making a bold statement: “I am Here. I am surrounding you. Why do you doubt?” Oh, that thing called patience and trust. Vertical and horizontal lines etched within the brick building brings a reminder of the cornerstone of faith. When in doubt, I keep looking up, and I find these symbols of faith all around. The lines in this photo. The lines for communication in earlier times was a connection point, but now they are often lines of division, boundary lines, lines to cut in front of others instead of bringing together. This everyday cross, with cross upon cross, reminds me that sometimes it can feel like the lines in life try to hold us down, cut us off, or pull us away from meaning, but through it all, the Cross is solidly there as our support, our strength, and our beacon. Our rise above! Not a hollow shadow, but a solid form lining our hearts. It’s for us to shape the lines of faith – fill in with trust, color with hope, and create with persistent prayer. May our cross lines be full. BREATHE in faith! LiveBreatheAlive.com – Designed to encourage others to seek and see the cross in everyday life. Love the photo and message!! An observation of two other elements I noticed, it’s as though at the center of that cross is a shield and at the arms of the cross are lines anchored toward the ground, which are also tethered to the shield. It’s as if to reveal our faith is also our shield that anchors us! Wow! Ephesians 6:10-18 in a tangible image!! How amazing!